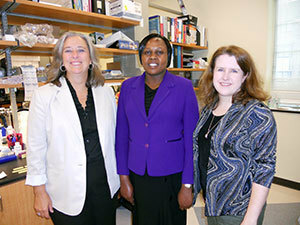 In 2010 and 2011, Katherine Taylor, Eck Institute’s director of operations, visited Moi University Teaching and Referral Hospital in Eldoret, Kenya, where she met Rispah Torrorey, a doctoral student, and her faculty adviser, Simeon Kipkoech Mining. The value of partnering with Notre Dame to expand Torrorey’s training and to perform more in-depth analysis of the breast tumor samples she was collecting was immediately recognized. Hosted by the Eck Institute, Torrorey first visited Notre Dame last fall. Although she met with more than a dozen Notre Dame faculty, it was Sharon Stack, Anne F. Dunne and Elizabeth Riley Director of the Harper Cancer Institute, and assistant professors Laurie Littlepage and Jenifer Prosperi who shared Torrorey’s passion to contribute to research that may ultimately improve the lives of women with breast and ovarian cancers. Stack immediately set out to find funds to support the advanced genetic characterization of the breast tumor samples that Torrorey was collecting in Kenya. She was able to quickly obtain a grant from the Walther Cancer Foundation. With the grant and with additional resources from the Eck Institute and Harper Institute, Torrorey has returned to Notre Dame with the tumor samples and a rigorous schedule of training and research ahead of her. “Cancer incidence in Kenya and other parts of Africa is rising at such an alarming rate that anyone would be concerned,” Torrorey said. “Breast cancer in our population used to be a problem of elderly women, but now it has turned to be common in younger women, even at 15 years, and is also seen more in men than before. Both institutes will seek additional funding to extend the research collaboration to other doctoral students. AMPATH (Academic Model for Providing Access to Healthcare), led by the Indiana University School of Medicine, is a consortium of North American academic centers, including the University of Notre Dame. All are working in partnership with Moi University, Moi Teaching and Referral Hospital and the government of Kenya. Notre Dame’s role in the partnership is to build equitable partnerships that advance basic science research capacity at Moi University and Moi Teaching and Referral Hospital. The Harper Institute and Eck Institute bring Notre Dame’s expertise in basic science to the AMPATH partnership. Researchers in the Harper Cancer Institute are dedicated to conducting innovative and integrative research that confronts the complex challenges of cancer. The programmatic structure of fosters multidisciplinary cancer research by promoting interactions among research groups with distinct expertise and by training young scientists to work across scientific fields. Clinical partnerships provide key translational insight and strengthen the mission of discovery.